Click here for all our past Newsletters! Add your name to our newsletter list by sending us an email at gardens@inverawe.com.au or contacting us directly. 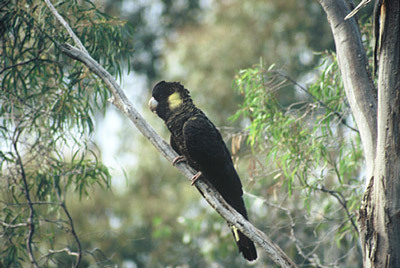 Yellow tailed Black Cockatoos are regular visitors, hunting for borer grubs under the bark of Acacia and Casuarina trees. They locate the grubs by listening to the crunching sound the grubs make as they chew through the tree. Strategically located seats entice visitors to just sit and admire the view. 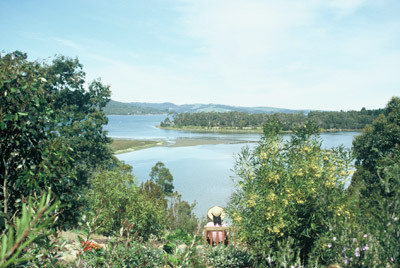 200 or more years ago French explorers anchored in the bay, giving names to many Australian plants. Plaques give further information on plants and help set the garden in its historical, cultural and social context. 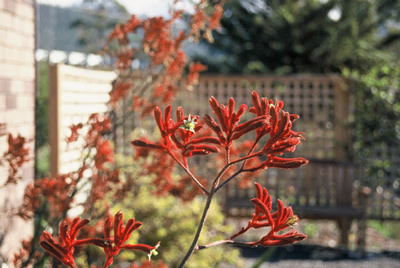 Kangaroo Paws, including this giant red Anigozanthos flavidus flower nine months of the year, only pausing in mid winter. 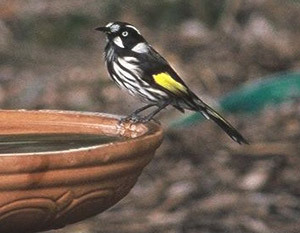 The cheeky New Holland Honeyeater is the dominant species in the nectar rich garden.